Looking from above the saddle-shaped brown spot lined with white calls out for you to poke it. 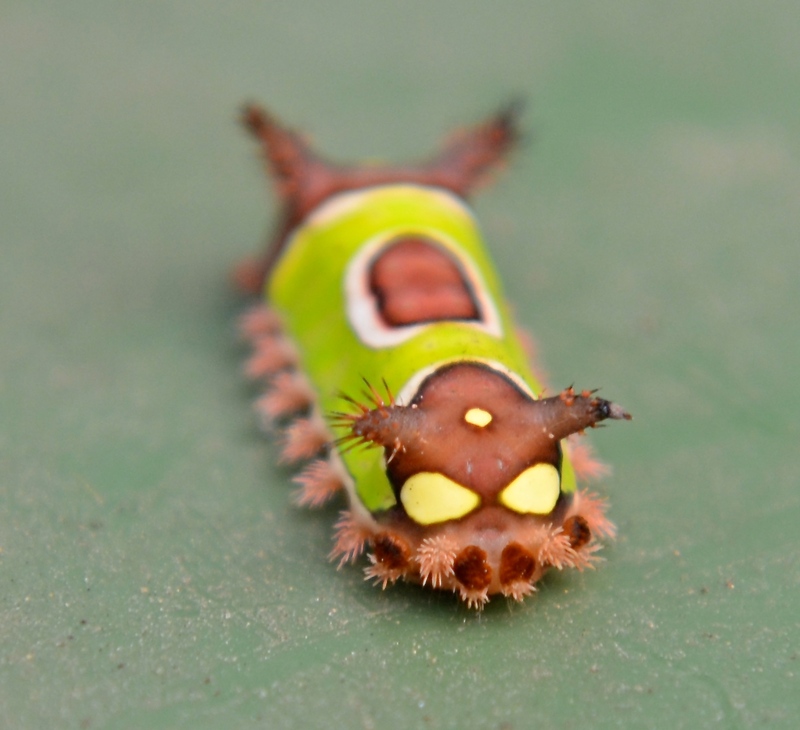 Do not touch this caterpillar. 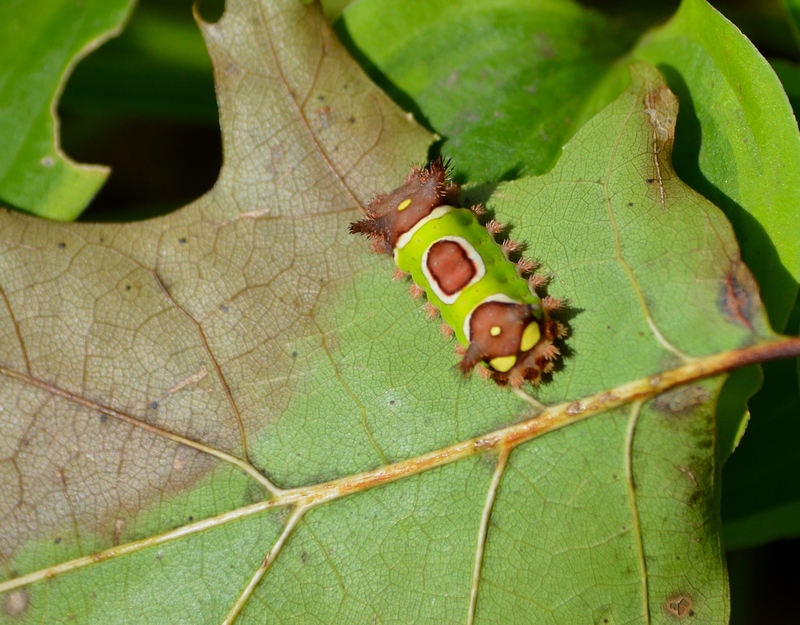 The front end of the Saddleback Slug Caterpillar does not look so alarming as the rear. 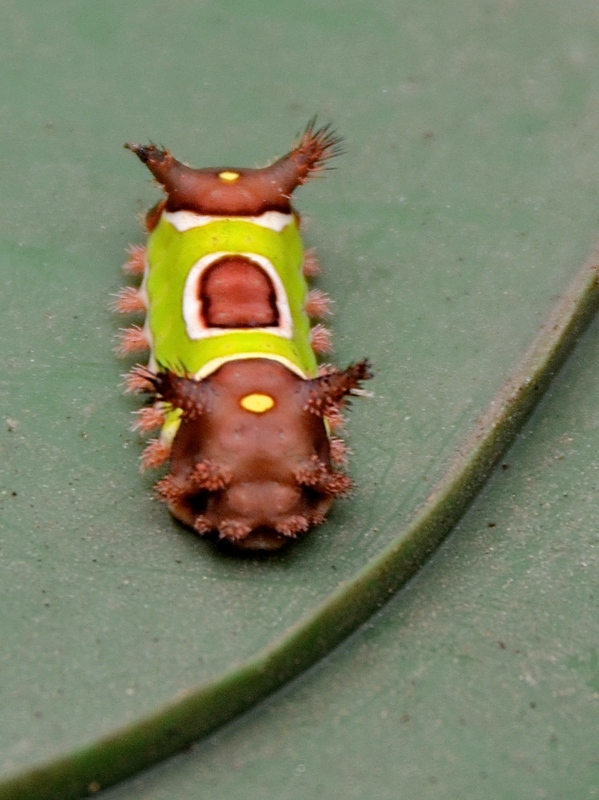 The Saddleback Slug Caterpillar is obviously named. The slug part of its name refers to the foot underneath that looks like a slug foot, that allows that caterpillar to cling to leaves and to carry on feeding. However, this is not a slug but a member of the Lepidoptera (butterflies and moths). After the caterpillar turns into a cocoon, the next stage in its metamorphosis is to turn into a nondescript brownish adult moth with one white dot on either side of its wing. 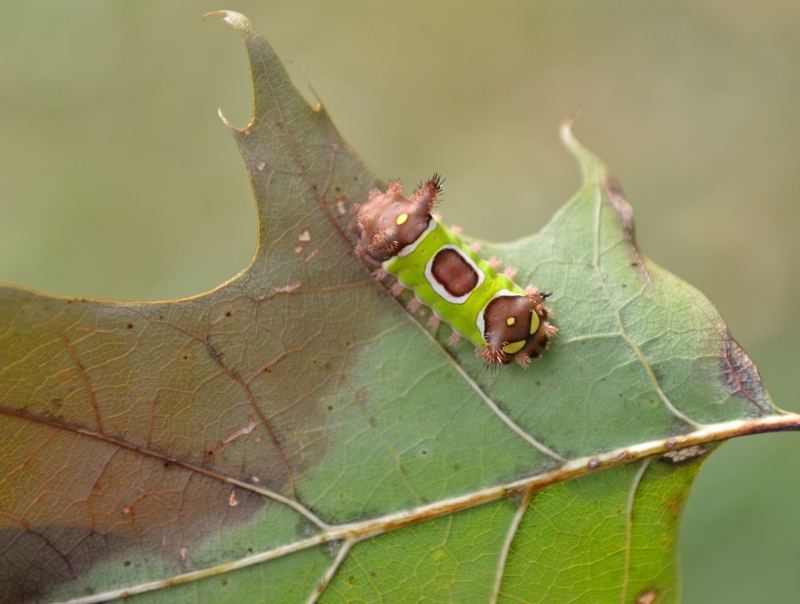 Saddleback Slug Caterpillar shown here on an oak leaf but it can be found on many landscaping plants including maples, palms, blueberries, viburnum, holly, aster, buttonbush and even grass. The bite marks show typical damage to leaves of this caterpillar. Caterpillars get bigger by molting/moulting their outer skin. Each stage is called an instar. This a later instar caterpillar as the saddle shape on its back is well defined. It has been feeding for about 4-5 months in the landscape to get to this size. Note the size of this stout looking caterpillar in relation to the thumb nail. Length is just less than an inch (2cm). 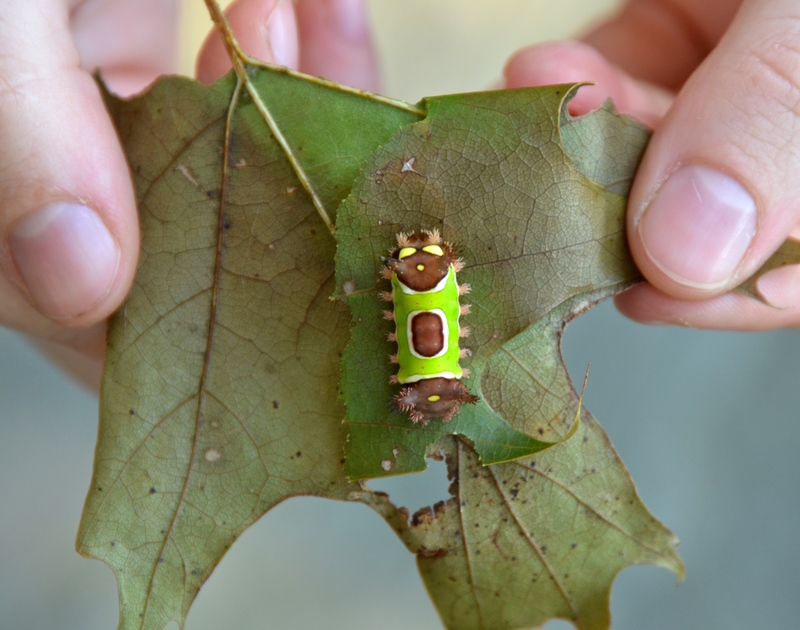 At first sight this weird caterpillar looks like an odd gum wrapper with its bright green color and four brown horns sticking out of the ends. It actually sticks to objects like gum, but there the similarity ends. This is more of a Harry Potter type of beast, it looks fun, but it is nasty. As much as you are tempted to poke it right in the middle, do not. If you push down on the middle, both ends of the caterpillar will bend in and get you. This happens to be one of the most poisonous of the caterpillars found in Eastern North America. It has venomous spines that are hollow and will stick into your skin leading to nasty reactions in your skin and body. Found all the way up and down the East Coast, and across to Kansas, this caterpillar can eat a whole range of landscape plants. Often you can identify an insect pest by what you find it feeding on in your garden; not so the Saddleback Slug Caterpillar, as it feeds on all kinds of plants. As a gardener the primary danger is not to your plants but really to you. No wonder my dermatologists said to me, as she looked over her glasses at me, “really is it too much trouble to take the extra five seconds to put on a pair of gardening gloves”. Maybe this time I will listen to her? I found two of these guys in my yard in Southern Maryland recently; I suppose the first was a younger instar, as it had no spines and no protuberances other than four vestigial horns. It was pretty smooth all over, with no sign of the leg-like protrusions, false eye spots, or facial wrinkles. In fact, I couldn’t tell one end from the other, but it DID have the distinctive saddle-spot. The second one looked pretty much like your pictures. Just how serious IS their venom anyway?